My third week in Switzerland was much more subdued than previous weeks, mainly because I really needed to concentrate on getting a large chunk of my course done. Although the home learning course has no deadlines (I have to book exams myself and can wait until I am ready to do so), I was eager to try and get through as much of the course material as possible as I felt I needed the certification on my Curriculum Vitae to be able to find a job here. And so, I spent almost the entire week staring at the computer screen, trying to absorb as much information as possible. Not the most fun week I have ever had, but I made a lot of progress on my course so some good came of it. 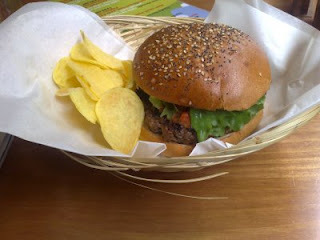 At the weekend Pascal invited us to accompany him and Caroline to a burger restaurant called "Holy Cow! ", which he claimed made the best burgers in Lausanne. Being a McDonalds fan I couldn't see how anything could top the McFondue, but Pascal seemed convinced that this place was even better than the hallowed burgers sold at Maccy D's - to be honest, Pascal is a bigger fan than I of Big Macs, McChicken Sandwiches and all the other gloriously unhealthy food pedalled out by the famous fast food franchise, so I decided to take him seriously. I have to say - he was right. The Big Cheese burger I ate at Holy Cow! (accompanied by crisps instead of french fries) was the most succulent burger I have ever tasted, blowing the Quarter Pounder right out of the picture. Price-wise it compares to a McDonalds meal here (both around the 12.- CHF mark), so it was a bit of an eye-opener for a fast food fan like me. Ho ho ho, merry... October? Oh yes, and whilst having a coffee in the town centre a man walked past with a vegetable strapped on top of his head. I think the vegetable in question is fennel, but I can't be certain. Have a look at the photo and let me know if I'm wrong. Exactly why Vegetable Man had a fennel perched on his head is unknown, partly because I didn't want to ask him in case his answer confused me even further. Vegetable Man walked past the rows of people sitting outside the café, stopping to speak to a few as he passed them. Perhaps he is some sort of local celebrity? Maybe a politician attempting to make an agriculture-related statement to the people? 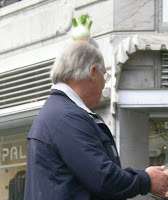 Personally I found the fact that a man walks around with a vegetable perched on his head very strange indeed, but as no one else seemed to bat an eyelid I assumed this must be normal here, and went back to sipping my drink. 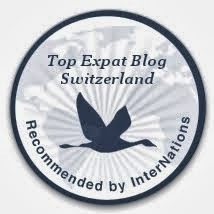 Need another fix of life in Switzerland? Read "Sixty Days in Suisse - Part IV"!